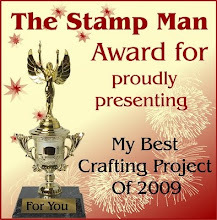 The Stamp Man: New - The Stamp Man - Limited Edition Shabby Chic Bag Giveaway! 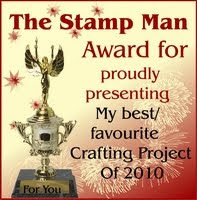 New - The Stamp Man - Limited Edition Shabby Chic Bag Giveaway! We have another gorgeous Shabby Chic bag to give away to a lucky Stamp Man Shopper!!! 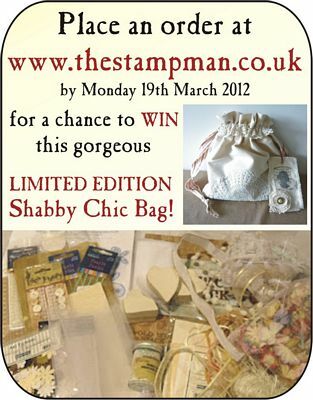 From yesterday until Monday 19th March 2012, all orders placed on our website will qualify for a chance to win this fabulous shabby chic bag filled with lots of shabby chic loveliness! Just two of these limited edition bags have been handmade by our newest Design Team member Caroline, Craft Mix, and this is the last... as the other was won by Lynn before Christmas! Lucky, lucky Lynn, and now maybe lucky lucky YOU! I could REALLY, very easily, have snapped up one of these bags for myself, they are fab, but Caroline very kindly made them for us to give away, and so we are. I gathered lots of lovely goodies together and I can tell you that this bag is FULL to bursting with all sorts of things including some of the Stampendous Shabby Chic embossing powders that are proving to be very popular at the moment for Fran's Encrusted Jewel Technique, I think it works so well with the shabby chic style. I've also included some of my precious ribbon, yes, precious!! It is the most loveliest ribbon I have stroked for a long time, (not literally, I haven't physically touched it all, just mentally stroked and hoarded the whole roll to myself. OK....I've only used a little of it, honest!). I have lots of other ribbon that I love too, but this one is just... the one, and I'm sharing it.... just saying!! 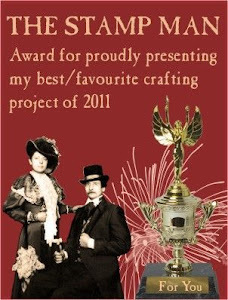 I made a You Tube slide show of most of the contents a while ago, it doesn't all feature there but it will give you a good idea of what you could win, click HERE for a little peek. 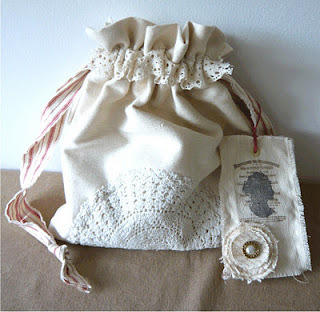 Wow this Shabby chic bag looks fantastic, what a fab giveaway. New Alcohol Inks from Dreamweaver!